Director Umesh Shukla, who marked his not so entertaining directorial debut with Dhoondte Reh Jaoge, roars with full power with OMG! (Oh My God) which garnered him the top notch status but who knew it was temporary. He did enough damage with All Is Well which didn’t do well for the critics and audiences too. Umesh is back with 102 Not Out, yet another adaptation of a Gujarati play under the same title. Written by Saumya Joshi, the film is delightful but staged in bits and pieces. Dattatarya Vakharia (Amitabh Bachchan), an 102-year-old wanting to break the living record of a Chinese man. 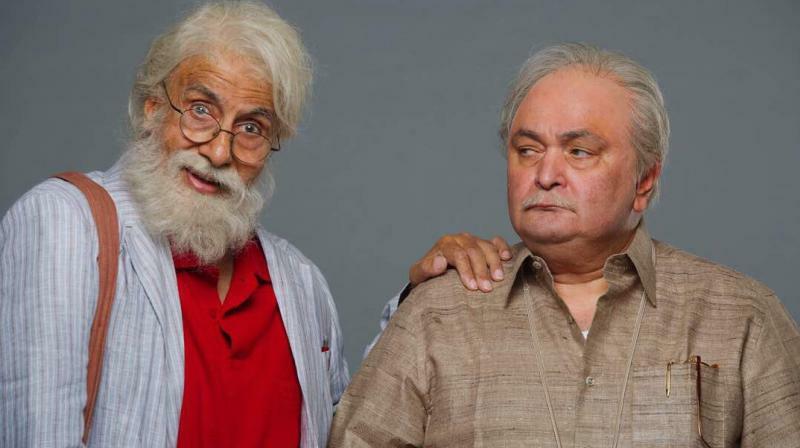 He insists his 75-year-old grumpy son Babulal Vakharia (Rishi Kapoor) to shift to an old age home. In order to stay back, Babulal had to agree few terms and conditions set by his father and one of them is to boycott his own son Amol (Mukesh Hariawala), who is based in USA. Dhiru (Jimit Trivedi), a helper at a chemist is a constant witness of the love-hate relationship of father and son. Will Babulal agree to Datta’s never ending conditions or move to old age home? The driving force of the film is the camaraderie of Mr. Bachchan and Rishi Kapoor. Extremely high on emotions, 102 Not Out has a universal appeal. It has humour and emotions in the correct proportion. Umesh succeeds in telling this moving tale with ease. However, the film looks pushy at certain places but a great message and strong performances of both the veterans overwhelmingly saves you from the boredom. The film cleverly holds you for 102 minutes despite of its slow pace in the first half. Second half draws attention, though predictable yet with the realistic climax. The film is a heart warming experience of celebrating life as it comes. Umesh might get the status of a good filmmaker with this one which he lost during All Is Well. Story and dialogues by Saumya Joshi are good but have uncanny resemblance from Amitabh-Hema starrer Baghban. Humor scattered all over is like a fresh air of breathe. Rishi Kapoor stands out as a grumpy old man. He makes you laugh and cry adequately. Amitabh Bachchan is hilarious and jovial barring his partial Piku strings attached to this role. Jimit Trivedi and Mukesh Hariawala are good enough as a supporting cast.